The National Joint Registry (NJR) was set up by the Department of Health and Welsh Government in 2002 to collect information on hip and knee replacement operations. In 2008 the management of the NJR was transferred to the Healthcare Quality Improvement Partnership (HQIP) and in 2013 Northern Ireland joined. Scotland does not submit any data. Hip and knee replacement data from the National Health Service has been collected from 2003, but it was only in 2011 the submission of data became mandatory. However, the private hospitals sector has been obliged to submit data since the inception of the NJR. The need for a Registry and post surgery surveillance of hip and knee implants became of paramount importance following the disastrous use of the 3M Capital hip prosthesis. This particular hip replacement was implanted in approximately 4000 patients in the 1990’s but it was only towards the latter end of the decade it became apparent that the failure rate of this particular hip replacement was far higher than would have been expected. A registry would have identified problems, leading to the earlier withdrawal of the implant. The NJR collates data on hip and knee implants allowing ‘real-time’ monitoring of the performance of all available prosthesis. In 2012/2013 there were 82000 and 91000 primary hip and knee replacements performed respectively in the United Kingdom (excluding Scotland). Another principal aim of the NJR is to provide surgeons with accurate analysis of their own hip and knee replacements and provide data on longevity of their implants. I have been submitting data to the NJR since my appointment as a Consultant in 2006. 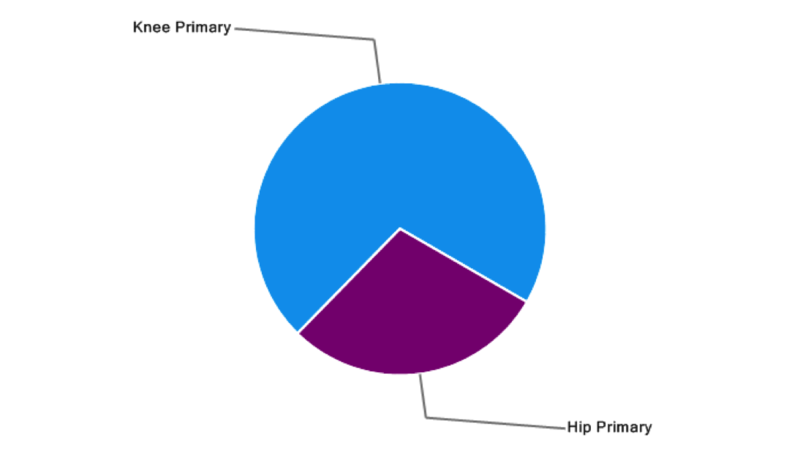 My practice is predominantly primary hip and knee replacements with a preponderance towards knees. Will my operation be successful? How competent and successful is my surgeon? How many procedures has he performed? The number of operations a surgeon performs is another parameter that provides reassurance to patients regarding his experience and capability. 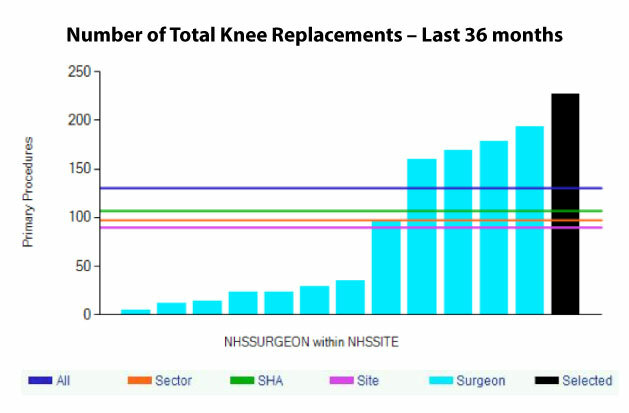 Below is a graph presenting the number of total knee replacements performed by Wolverhampton surgeons over the past three years. My statistics are highlighted by the black column. 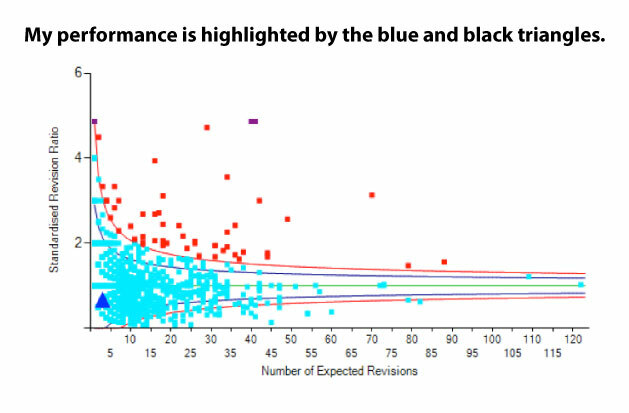 The blue columns represent data for other surgeons in Wolverhampton. The data table below the graph shows the national average number of knee replacements over the past 36 months performed by any surgeon is 130, whereas I have performed 227. Another simple method by which patients’ can be reassured of a surgeon’s capability is by a chart called a funnel plot. This technique records all knee or hip replacements by a surgeon and monitors them over succeeding years. As long as the surgeon maintains his position within ‘the funnel’ and is not highlighted by a red square then a patient would expect to have a long term successful joint replacement. 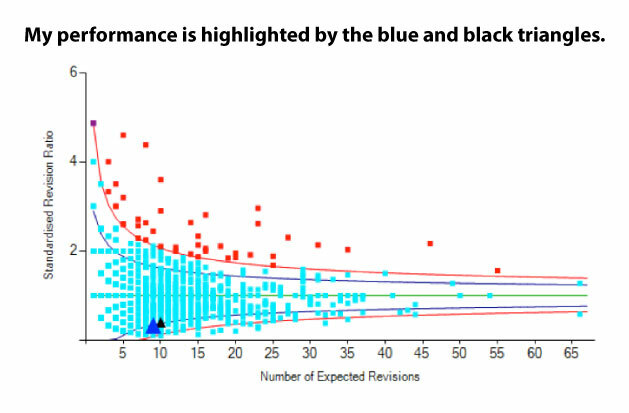 For a more in-depth review of funnel plots, please click here. Below are presented my funnel plots for knee and hip replacements since I became a Consultant in 2006. Both show my reassuring position within the funnels. I trust the above information has been informative, but if you have any further queries, please do not hesitate to contact myself or my secretaries.